In preparation for our company’s keynote speech at the Land and Housing Forecast in Phoenix this week, it became clear to me that Phoenix is positioned for huge growth. Five of the main demographic trends noted in the book Big Shifts Ahead—which helps make demographic trends easier to understand, quantify, and anticipate—all point to growth in Phoenix. 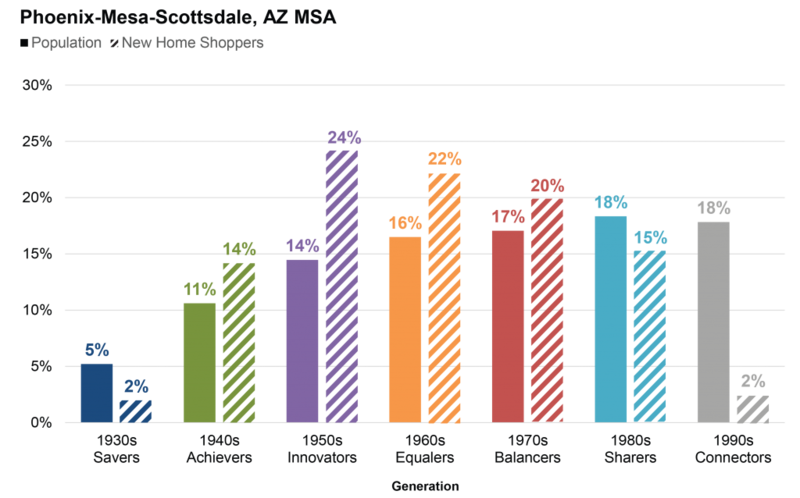 While Phoenix’s population skews young, Phoenix home shoppers skew old, with 62% of new home shoppers over the age of 46. 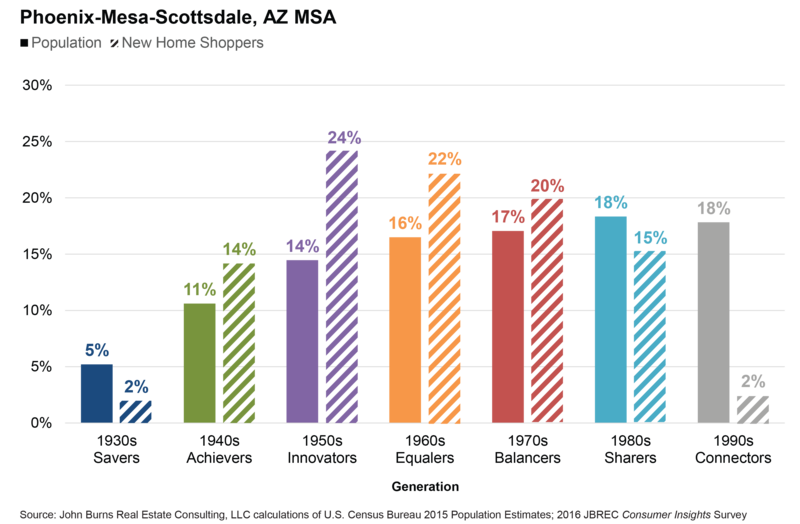 Almost 24% of Phoenix new home shoppers were born in the 1950s, a generation we call the 1950s Innovators. Another 22% were born in the 1960s, and 14% were born in the 1940s. Due to great weather, affordable housing, and pro-growth governments, the book projects that 62% of household growth will take place in the “affordable sunshine states” where only 42% of Americans currently live. With half of Phoenix homes selling at prices below $236,000 and job growth that consistently exceeds the US average, Phoenix will continue to attract those workaholic baby boomers as well as their adult children. By 2025, 18 million more people than in 2015 will be 65 or older. That’s a whopping 38% increase from 48 million in 2015 to 66 million in 2025. 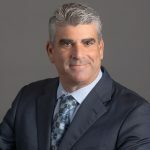 This growth will be driven by the 1950s Innovators, who started new companies at rates not equaled since, are tech savvy, have accumulated unprecedented net worth, and will be 7% more likely to work in retirement than those born just ten years earlier. Phoenix has a relatively low cost of living, a very well-established retirement community with great health care, and some amazing age-targeted new home communities. Great communities include DMB’s Eastmark and Verrado, Newland’s Estrella (featuring AV’s Canta Mia), Shea’s Trilogy Vistancia and Encanterra, and numerous Pulte / Del Webb communities. Phoenix knows how to build quality suburban communities, including surban communities (urban living in suburban cities). During the next decade, the book’s authors forecast that 79% of household growth will occur in the suburbs and that a growing share of development will be higher-density surban living, much of which will be rental housing. 1970s Balancers like me love suburban Phoenix, where we can find larger homes at great prices. Unfortunately, suburban demand has been held back by the tremendous number of people born in the 1970s who went through foreclosure in Phoenix or still have negative equity. This demand will return slowly over time. Nonetheless, three of the best-selling master planned communities in the country are in Phoenix (Eastmark, Vistancia, and Verrado). Urban living, which has enjoyed a resurgence, will continue to grow in popularity, but mostly in suburban environments. A new supply of smaller homes with little or no yards in high-population areas will meet the demand to commute less and live closer to restaurants and entertainment. Builders throughout Phoenix are embracing surban product with cool infill homes in communities like downtown Scottsdale. So if You’re Building in Phoenix, What Are You Gonna Do? Build age-qualified housing targeting those 1950s Innovators. Load them out with technology and entertainment spaces. Check out the cool vintage rock memorabilia in the Encore at Eastmark models by AV Homes. Don’t forget what drives Phoenix: great homes in the suburbs. Understand your buyers are going to be younger and more interconnected. Taylor Morrison’s Venture Collection at Sanctuary at Desert Ridge offers homes starting as small as 1,600 square feet that incorporate open living concepts with great indoor/outdoor spaces for entertainment. Downtown Tempe is the poster child for surban living, with dozens of restaurants and retailers that supplement major employers such as Microsoft. Look for opportunities to build higher-density infill homes close to amenities and good schools. All that being said, lot prices in Phoenix have become so expensive that great market research is critical to build the right homes at the right price in the right location. Come join me and John Burns at the 7th Metro Phoenix Land and Housing Forecast presented by Land Advisors at the JW Marriott Scottsdale Camelback Inn Resort & Spa on December 7. If you can’t make it, send me an email, and I will send you our slides. For definitions of the generations shown above, visit https://www.bigshiftsahead.com/the-generations/.